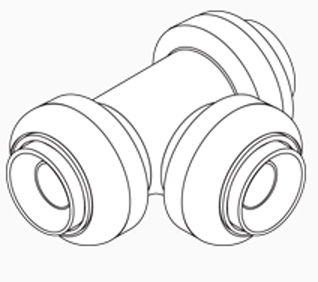 Home :: Push-Fit Fittings :: Push Tee 1" x 1" x 1"
Push Tee 1" x 1" x 1"
Push-fit Fittings are designed to simplify pipe installation. The fittings allow the user to connect pipe in seconds with relative ease. Instant push-fit connection for increased ease-of-use. No soldering, clamps, unions or glue required. Fits copper tubing and PEX piping and connects in any combination. TEE,1"X1"X1"